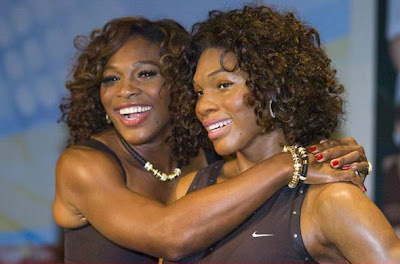 In conjunction with the US Open, Serena Williams' wax figure was unveiled at the Madame Tussauds, in NYC yesterday. Serena's wax figure shows her wearing a replica of the outfit which she wore during the 2004 US Open, a Nike denim tennis skirt, with a black Nike sports top and sports shoes. Can you tell which one is really ME? Other tennis icons who have their own wax figures include Billie Jean King and Martina Navratilova. Work it, girl, work it!